Electrical System Design – Custom Chassis, Inc.
With equipment more then ever reliant on electrical devices and electronics it is important that these devices be wired and programmed properly to communicate correctly. Custom Chassis provides complete custom electrical system design for mobile equipment. Our services include schematics for prototype machines, changes to current production, R&D test equipment. Custom Chassis offers the complete design package, from idea to installation. Device mounting and routing design. In any analysis of the electrical system for a whole vehicle, there are many factors to take into account. Custom Chassis has spent many years developing the knowledge to ensure that the systems we design will work and are robust. 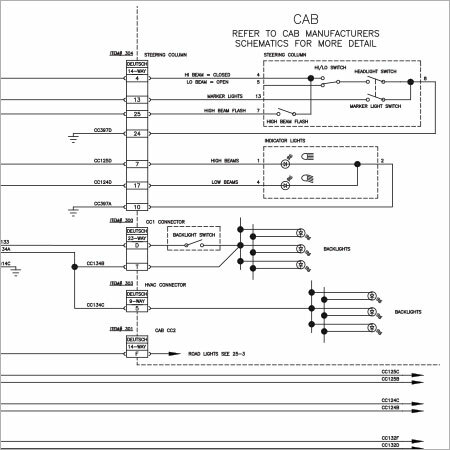 By properly creating the electrical schematics for hydraulics and other systems, the results are greater responsiveness, finer control, higher efficiency and increased reliability.